Tupperware is making me an explorer in my own city. Two parties this week, both in areas of London that are new to me. I had never even heard of Kent House station: it's not that far from me, but I have to take two commuter trains to get there. The trains are packed and my kitbag is in everyone's way. I just have to brazen it out. The roads and pavements around the station are all gravelled, very odd. At Claire's house, I throw my cloth over her kitchen table and two-year-old Edward promptly spits up a wad of half-chewed peanuts on it. Bless wet wipes. But after this inauspicious start, it is a nice party with friendly people and excellent snacks, especially Tony's bean, spinach and mango wraps, slice on a diagonal. I miss my last train connection and have to take the 468 bus from Herne Hill. This is the bus on which someone was murdered last week. Sleepy and punchy, I start imagining it was me. People are rifling through my kitbag trying to establish my identity: "I don't know who he was, but this silicone spatula is fantastic." Next day Viv convenes some friends and neighbours in a community centre behind Stockwell tube station. She has a lot of no-shows, but Viv and her 3 guests have fun as we use the centre's kitchen to knock up a quiche without pastry and some peach smoothies. One guest is really keen to book me for a fundraiser at her local Catholic old peoples' home, but she needs to check first that Mother Superior wants to be hostess. I hope so, because the new Accessories Organiser will be fabulous to stop her rosaries getting tangled. Two parties in two days, plus it's the busiest time of year in my day job and I am doing it full-time at the moment. I am knackered, it's raining, and even though I run with the kitbag when the bus passes me, I just miss it. 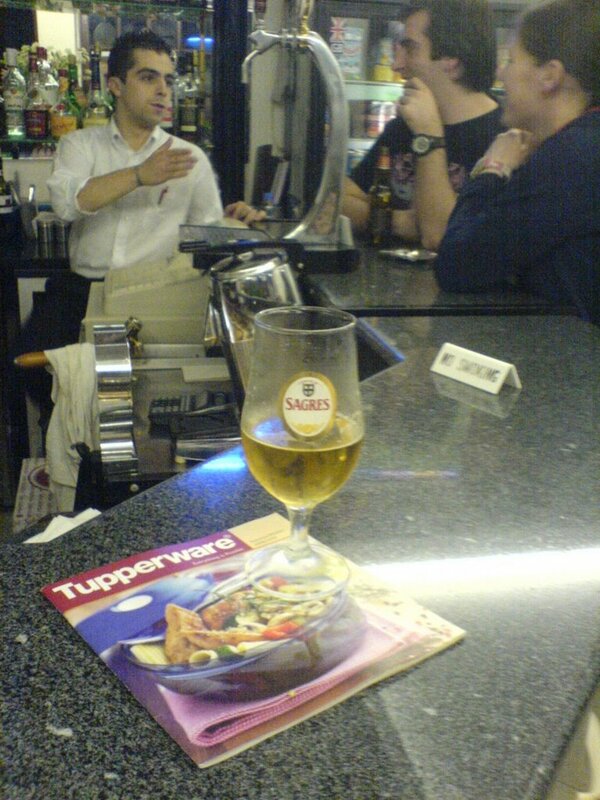 With 20 minutes to go before the next one, I slip into the little Portugese bar by the bus stop -- I am in the heart of London's Little Lisbon -- and order an ice-cold Sagres beer. It is my first pause for a rest all week, and the beer tastes sensational.